Yes, it is recommended to book online to avoid service fee, or via our android or iphone apps. If not by phone on +33(0)4 86 57 26 22 or by email. In those 2 cases, service fees might apply (check our prices section for all details). For bookings for today (with less than 12h notice), please call our driver on +33(0)6 09 73 90 67. You may cancel a booking without any fee up to 90 minutes before your appointment time with your driver. You may do this online, inside your customer's area. After this delay, a 45€ cancellation fee will apply. You'll be reimbursed of any amount you're entitled to in the days following your cancellation. Don't worry, all of our customer's flights are checked in real time, so your car will be waiting for you upon your arrival as scheduled without any supplementary charge. You must immediately let us know by phone +33(0)4 86 57 26 22 or on our driver line if you return in less than 6 hours (+33(0)609739067) and give us your new flight details. If the changes are made with less than 90 minutes notice before the initial arrival time, a 45€ fee will apply, added to the regular charge you would have paid. Yes, our valets operate 24h a day and 7 days a week. As soon as a reservation is confirmed with a reservation number, our valet will take care of your car as scheduled. If, despite the great professionalism of our drivers, your car is damaged upon your return (the voucher signed upon departure will be taken into account), be confident : your car is fully insured and any damage will be at our charge without any claim to your insurance. Yes thanks to our bonus with our prepayment offers and with our unlimited offers. All explanations are on our page "our prices" and on our page "be rewarded". For more informations, contact us online or by phone on +33(0)4 86 57 26 22. Yes, you just have to click in the "return date unknown" box in our booking form. You will only pay the valet-parking service when you book and the remaining fee will be paid once you know your return date. You will then have to enter your return details in your customer's area and pay the remaining days. 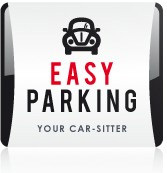 Your car is parked according to your choice in a fully secured and guarded car park : wether it is outside or inside, it is located at around 2 km outside the airport.